Loki has trapped Mythic Hero Val in Terminus alongside Shin Sekai Koji. Locked in Terminus, Prizefighter Cross has his own ambitions. Loki has been capturing Legends before they can reach Valhalla before Ragnarök, trapping them in Terminus, an endless prison. For a limited time, the Revenant and Cosmic Chests are available with exclusive Skins! Phase in and out of visibility as you fight for your escape from Loki’s prison! Queue up against 2 other Players in a 3 minute FFA game with 300% damage. Score 2 points for KO-ing an enemy, lose 1 point for being KO’d. All while you and your opponents go invisible when not using powers! We’ve made some graphic improvements to help improve framerates on all consoles. We’ve made minor adjustments to matchmaking, designed to slightly expedite matchmaking times for players at the outer extremes of the Elo range. The replay bar will now mark times for goals scored in Brawlball, Kung Foot, and Beachbrawl with the head of the player that scored each goal. Resuming a replay will now correctly exit frame stepping. You can now update your inventory items while in an online or offline lobby, giving you the ease of customization. If you’re locked in or already on the character you want, your spawn bot will not be updated until you switch to a new character. Improved console rendering of Valkyrie Horn. Improved console rendering of Bouncy Bomb and Spike Ball. For PC, we’ve added Dash Deflect sound effects. Fixed an issue with the Orb Down Air that would cause it to give odd results against slanted surfaces, like the ones in Fangwild. The results should now be a close approximate. Fixed a bug where your region for 2v2 could be showing up incorrectly during the season. 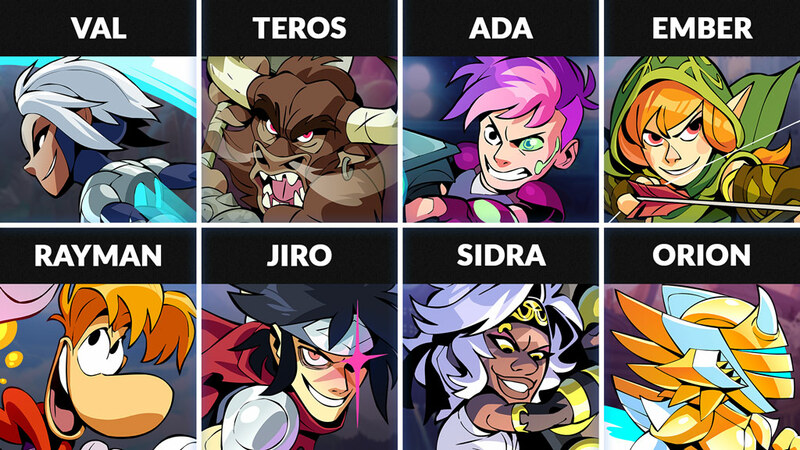 The new Legend rotation for this week includes: Val, Teros, Ada, Ember, Rayman, Jiro, Sidra, and Orion.